Web Map Service from & to Smallworld: Add weather, landbase, OpenStreetMaps, Bing, etc. WMS or Web Map Service is an interface standard that provides map images from one or more distributed geospatial servers, over HTTP. Atlas supports WMS, and uses it to overlay certain data layers such as weather information, both in the mobile and desktop apps. Now, with the Cliffhanger WMS plugin, we added WMS support to GE Smallworld GIS. Out of the box, Smallworld already supports Google Maps. 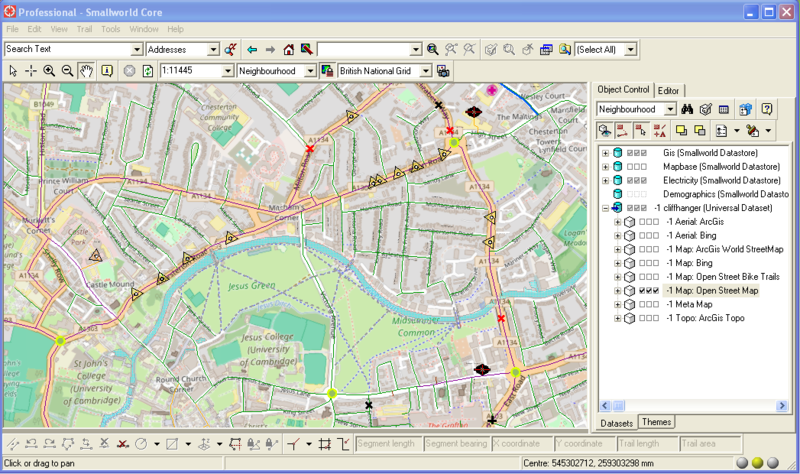 But with the WMS plugin, you can now add Bing, Open Street Map and many other map services to your Smallworld application. Additionally, with Cliffhanger Atlas, you can publish WMS compatible maps (generated) from your Smallworld data. Add Open Street Maps and other map services as a background layer to your Smallworld GIS, as an alternative to Google Maps. Overlay your Smallworld GIS with Weather data. Replace DXF (vector) data with WMS (raster) data. This can have a dramatic positive effect on render performance: instead of rendering 1000′s of vectors, just render one image map. Replace Smallworld VMDS ‘view-only’ data with WMS: If you want to display background data such as land base, but you don’t want all the overhead of objects, styles, and datasets, consider replacing it with a WMS. This is particularly useful in Smallworld 5 to address performance issues. Load the Cliffhanger WMS Magik plugin. Add an entry to the SOC (Spatial Object Controller). Turn the desired map layers on in the ACE. $10 per named user per month. Volume discounts and enterprise licensing available.